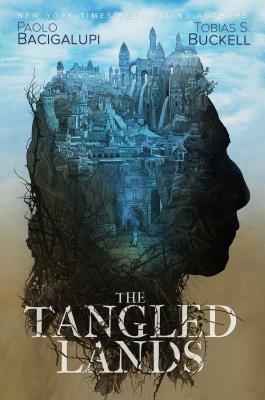 The Tangled Lands is a dystopian fantasy about survival in the midst of magical treachery and environmental devastation. In and around the city of Khaim, overuse of magic created an environmental catastrophe. Bramble, a plant that buries everything, puts those who touch it into a deep and ultimately deadly "bramble-kissed" coma, and use of magic releases a toxin that causes it to spread with horrifying speed. Four connected novellas show strong female characters rebelling against the tyrants manipulating this geopolitical crisis. Bacigalupi and Buckell have individually explored the effect of mankind's disastrous relationship with the environment in other speculative novels, and here present a world struggling for hope with a righteous sense of urgency and justice. From award-winning and New York Times bestselling authors Paolo Bacigalupi and Tobias Buckell comes a fantasy novel told in four parts about a land crippled by the use of magic, and a tyrant who is trying to rebuild an empire—unless the people find a way to resist. In four interrelated parts, The Tangled Lands is an evocative and epic story of resistance and heroic sacrifice in the twisted remains surrounding the last great city of Khaim. Paolo Bacigalupi and Tobias Buckell have created a fantasy for our times about a decadent and rotting empire facing environmental collapse from within—and yet hope emerges from unlikely places with women warriors and alchemical solutions. Paolo Bacigalupi is the New York Times bestselling author of The Windup Girl, Ship Breaker, The Drowned Cities, Zombie Baseball Beatdown, The Doubt Factory, The Water Knife, Plump Six and Other Stories, and The Tangled Lands. His writing has appeared in WIRED, High Country News, Salon, OnEarth Magazine, The Magazine of Fantasy and Science Fiction, and Asimov’s Science Fiction Magazine. He has won the Michael L. Printz, Locus, Hugo, Nebula, Compton Crook, and John W. Campbell awards. "Better known for their science fiction, Buckell and Bacigalupi are adept in their use of fantasy motifs. Khaim is textured, a vivid setting only begun to be explored. [These] novellas succeed as action-packed individual stories." "Paolo Bacigalupi and Tobias S. Buckell team up to bring a gripping fantasy to life." “All four stories are beautiful, subtle and well worth every moment spent reading them." "The Tangled Lands is a gripping story of resistance set in the last city of a crumbling empire, run by a tyrant and his henchman." "I loved the world building in this book of four short stories set during the same time period in a world where magic has been banned by a corrupt government."